Aerosmith's fifth studio album is a good one. It features Joe Perry's lead-vocal debut (on "Bright Light Fright." The title track "Draw The Line" is still a staple of their live set). 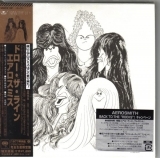 This mini lp was included in Aerosmith Box (1973 - 2001) which was issued in 2004 and contained 19 mini lp titles (16 by Aerosmith, 2 by Joe Perry Project, and 1 by Whitford St. Holmes). (No promo obis. ), and also, this mini lp was included in Rocks Box which was issued in 2006 and contained 10 Aerosmith mini lp titles (no promo obis). 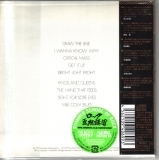 Cover:The cover of Draw The Line has a "paper-like" texture which has been faithfully duplicated on the mini lp release. Inserts (as per original):The LP inner sleeve has been faithfully reproduced. Lyrics:Japanese and English on a standard paper insert.